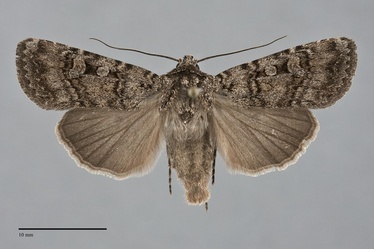 Euxoa terrenus is a common medium-size Euxoa (FW length 15–18 mm) with powdery gray-brown forewings with dark gray double lines, cell, and outline of the spots that occurs in a variety of habitats during the summer. The forewing is usually dark gray-brown or brown with a variable sprinkling of dark scales, but populations from arid environments can be light gray-tan. The cell is dark gray to black, and the terminal area other than the apex is variably shaded with dark gray. A short black basal dash is suggested in some specimens. The basal and antemedial lines are dark gray to black, double with components of similar strength, filled with the ground color or a slightly lighter shade, slightly irregular. The antemedial line is nearly perpendicular to the posterior margin. The median line is dark gray, faint except near the costa. The postmedial line is double with a dark evenly toothed inner and faint, diffuse, and smooth outer components, filled similar to the antemedial line, drawn basad on the costa and weakly convex around the cell near the reniform spot and angled slightly toward the base below the spot. The subterminal line is pale gray-tan, sometimes slightly yellow or orange, slightly irregular with an offset below the apex and weak W-mark on M3 and CuA1. It is preceded by a dark gray shade that is strongest on the costa and mid-wing, sometimes condensed into diffuse spots or short wedges. A series of black spots forms the terminal line. The fringe is concolorous with the terminal area. The orbicular and reniform spots are partially outlined in black and are moderate-size. The orbicular spot is round or slightly oval, often open toward the costa and sometimes toward the posterior margin, filled with the ground color or slightly lighter gray. The reniform spot is kidney-shaped, often incomplete anteriorly and posteriorly, filled with the ground color, slightly lighter gray, and often containing a faint dark lunule or a dark gray spot at the lower end. The claviform spot is black, small to moderate in size. 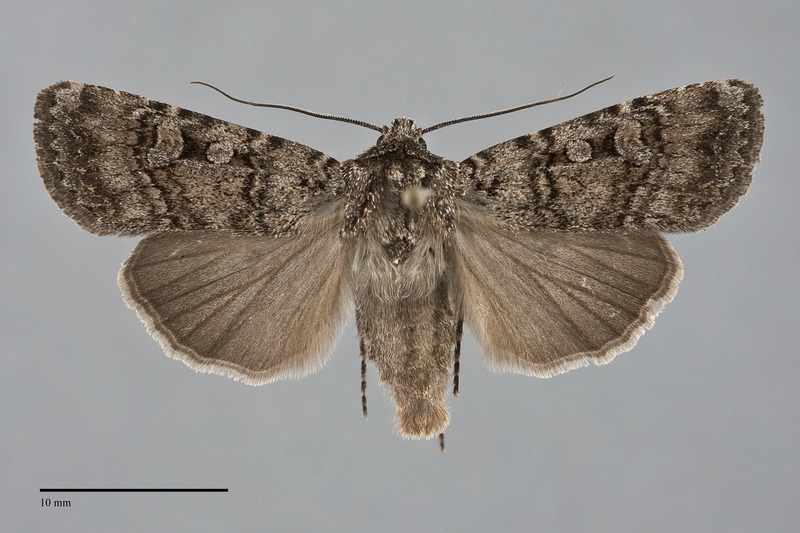 The hindwing is dark brown-gray, with barely darker veins, discal spot, and terminal line. The hindwing fringe is off-white with a darker base. The head and thorax match the forewing color, with a thin black transverse line across the mid-collar. A frontal tubercle is present. The male antenna is biserrate. Euxoa terrenus is placed in the largest subgenus Euxoa. 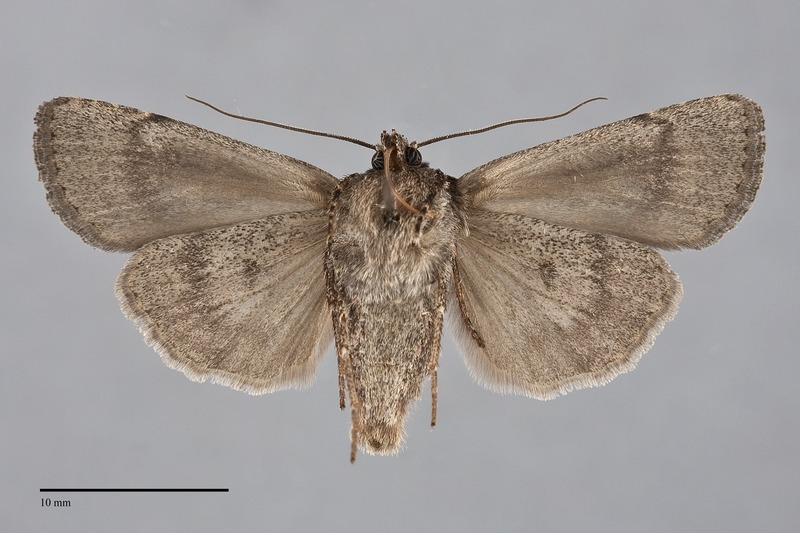 This species resembles many other brown Euxoa species but can usually be identified by the combination of summer flight period, powdery dark gray-brown color, dark-filled cell, double lines with components of similar strength, dark-rimmed forewing spots with filling of similar darkness to the ground color, and round orbicular and "normal" kidney-shaped reniform spot. It is most similar to Euxoa simulata and Euxoa comosa and flies with both species during the summer. Compared to E. terrenus, E. simulata is smoother brown, usually with a warmer yellow or orange cast, and its reniform spots is larger and heart-shaped or crescent-shaped. Dark gray-brown specimens of Euxoa comosa usually have a prominent median line and their spots are inconspicuous due to absence of a dark outline. Euxoa terrenus also resembles Euxoa altens and Euxoa extranea, both of which fly at middle to high elevations. As with E. simulata, the reniform spot of E. extranea is more strongly indented on the lateral side than that of E. terrenus and its orbicular spot is strongly oval rather than round. 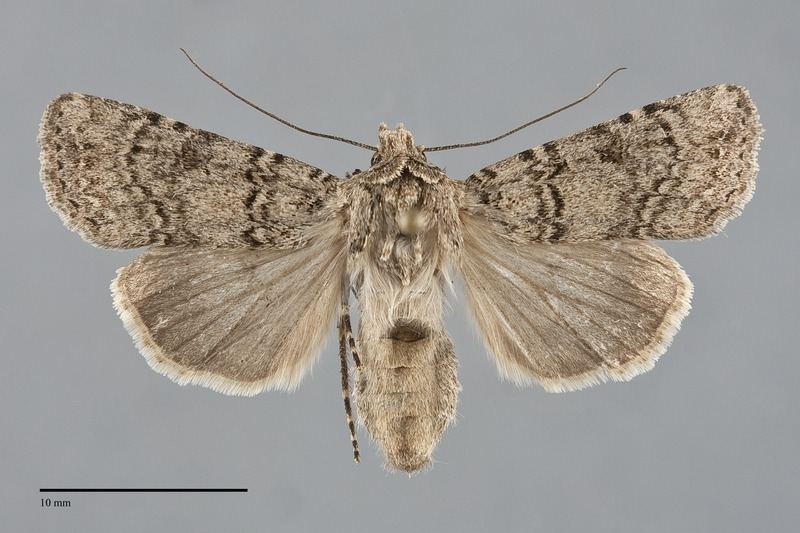 Euxoa altens is a fairly nondescript brown moth species that lacks the dark transverse lines of E. terrenus. At low elevations, E. terrenus can be confused with Euxoa scotogrammoides. It is patterned similarly to E. terrenus but differ from it in lacking dark gray or black elements. The type locality of Carneades terrenus Smith is Pullman, Washington. This species is widely distributed in coniferous forests. In the Pacific Northwest, it is common in mid and high-elevation spruce-fir forests and ponderosa pine forests. It is rare in coastal rainforests west of the Cascades. In pine forests, it is most common during wet years and declines during drought years. Euxoa terrenus occurs uncommonly in sage steppe, especially near the forest-steppe ecotone, but is more local in this habitat than in forests. Euxoa terrenus is widespread in the Pacific Northwest from the Coast and Cascade Ranges eastward. It also occurs to the west of the mountains, but it is less commonly collected there except in Oregon. The northern limit of its range is southern British Columbia. The northern range of this species includes the mountains of southern Alberta. From there and the Pacific Northwest its distribution extends south to Utah, northern Nevada, and California. It is widespread in the latter state, occurring south to the Transverse Ranges. 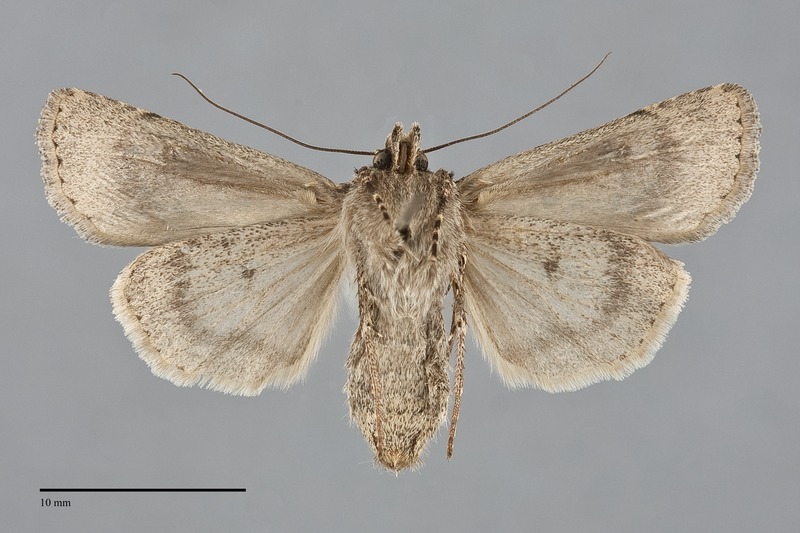 This species has a long flight season and can be found from late spring until early fall. However, the majority of the records for our region are from late July and August.